Talks between the government and Vatican have been held since 1990, but the latest round marked the first meeting of a working group studying the renewal of diplomatic ties. 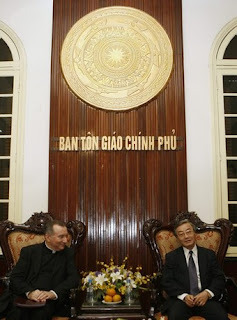 It was held in a "very frank and open atmosphere," Monsignor Pietro Parolin, Vatican vice foreign minister, told reporters after meeting with Nguyen The Doanh, head of Vietnam's religious affairs commission. "We have already set up good basis for further progress," he said, adding that it was impossible to say how long the process would take. "The outcome will be diplomatic relations." Parolin told reporters he hoped the Pope might come to Vietnam this year, although no plans had been made for a visit. "It depends on many things to be discussed, to be reflected upon, and I think that it's impossible to say yes or no," he said. The working group held its first sessions on Monday and Tuesday, when Parolin met with Vice Foreign Minister Nguyen Quoc Cuong. Foreign Ministry spokesman Le Dung said this week's meeting was an "important step" in the development of relations between Vietnam and the Vatican. "The two sides acknowledged the encouraging developments in the relations between Vietnam and the Holy See and also agreed to continue their efforts," he said. Parolin's delegation is scheduled to visit two dioceses in northern Vietnam later this week before departing on Sunday. Although communist authorities closely monitor faith groups and insist on approving most church appointments, relations between Hanoi and the Holy See have begun to thaw. Vietnamese Prime Minister Nguyen Tan Dung became the highest official to meet the Pope when he visited the Vatican in 2007. Vietnam has one of Asia's largest Catholic populations, with more than 6 million followers. In their ever-emergent Stateside diaspora, Vietnamese Catholics put on one of the US church's largest annual gatherings: summer's Marian Days in Missouri, which has grown to attract 75,000-plus over a weekend in August. Last year saw another milestone for the group -- the election of the first Vietnamese member of Congress, the Louisiana Republican Anh Joseph Cao, an immigration lawyer and former Jesuit seminarian.